Today we announced a raise of $16million from our good friends at Lightbox and BEENOS . Also, a big thank you to our angels (and relentless supporters). Also, a shout out to the entire droom family, you guys already know it but here it is again – you are ROCK STARS!! Ever wondered why buying a car or a motorcycle or for that matter, any automobile remains so cumbersome, full of anxiety, and pitfalls? Droom was created with a single obsession I.e. how to remove everything that serves as an impediment to why a transaction between two unknown parties may not take place. While this is a broad agenda, we at Droom, are working hard day and night to give buyers a buying experience second to none and sellers simple online tools, low transaction costs, and a scalable platform so that they can embrace a shift towards organized retail for automobiles in India. From the time human beings invented a perfectly round wheel, the adoption of technology has accelerated. The advancements in the automobile industry have been outcomes of technological advancement made by the human race in the last hundred years. However, the buying and selling experience, especially that of used automobiles remains very antiquated, full of friction and pain points. Consumer Internet and mobile technologies have brought unprecedented levels of disruptions and efficiencies in retail, travel, jobs, real estate, music, social networking, communication and many other large industry verticals. However, there have not been any significant innovations or disruptions in the automobile buying and selling experience online. There have been different attempts such as free listing driven online classifieds or rich content and lead generation driven online discovery platforms. However, both these attempts fail to acknowledge that the moment of truth in buying and selling automobiles is not free listing and lead generation but trust, pricing, and selection. At Droom, we feel very passionate about using a marketplace platform approach, technology tools and data sciences to build trust, pricing and selection advantages for the buyers and creating a simple, low transaction cost, and scalable platform for sellers. India is a low trust market and there is no ecosystem and well-defined regulatory framework for automobile buying/selling like the United States that can protect a buyer. Hence, in India buying a used automobile is called Buyer Beware. Unlike the US, India does not have a lemon law, any scientific approach to valuing a vehicle, a national level repository on automobile background and history, nor any tight law enforcement. Absence of all of the above factors in the ecosystem makes it very difficult to protect buyers because of a high degree of information asymmetry and moral hazard. While trust, pricing, and selection are much bigger issues in India, they are global issues and Droom is taking an innovative and disruptive approach to bring transparency, mitigate information asymmetry, and remove moral hazard and fractions so that a transaction between two unknown parties can take place. Automobile is a $125bn annual industry in India including $100bn in automobile transactions and $25bn in automobile services (e.g. insurance, auto inspection). As per our estimates nearly 50 million vehicles are sold in India annual including 30 million used vehicles, making India the 3rd largest automobile industry in the world. In 2012, India hit the inflection point, wherein the used automobile market became larger than new automobile market. Nearly 25 percent of households in India have two wheelers and only 5 percent have cars – so per capita automobile availability is really low. However, India is among the fastest growing automobile counties in the world. We expect the secular adoption of automobiles to continue to take place at least for the next decade and a half. However, more than 65 percent of cars sold in India have tampered odometers and more than 25 percent have some serious issues such as engine or flood damage etc. These are not known to the buyer and 1 out of every 10 vehicles does not possess authentic paperwork and documentation. As far as the online industry goes, we believe less than 0.5% of the total automobile industry is online and the experience provided by online classifieds and content rich discovery platforms is sub-standard and now antiquated. At Droom, we have built a marketplace that brings trust, provide pricing tools and builds selection so that both buyer and seller can have what they are looking for. With droom’s disruptive approach, a buyer gets a vehicle cheaper and a seller gets to sell it at a higher price. This is only possible because we are removing inefficiencies from the current system and creating a win-win situation for both parties and not just the seller. As a vision, we want to aggregate the global automobile industry online at a scale and level of efficiency never been done by anyone or in any part of the globe so far. We are as good as our ability to listen to the pain points and inefficiencies from buyers and sellers and offer our marketplace platform, technology and data science to fix those issues. At Droom, we believe that it takes 6-8 years to create a world-class consumer Internet company. We also have a strong culture of not throwing money at the problem but solving problems fundamentally. As a start-up, it is almost impossible to get everything right. We place huge emphasis on speed to market and the power of prototyping. We believe that Droom has and will continue to remove pain points and friction and make automobile buying and selling a very pleasing, exciting and fun experience. I am super excited and proud about the kind of innovations we are working on building a truly 21st century experience to buy and sell automobiles. Sandeep Aggarwal is a serial entrepreneur, philanthropist and Internet visionary. 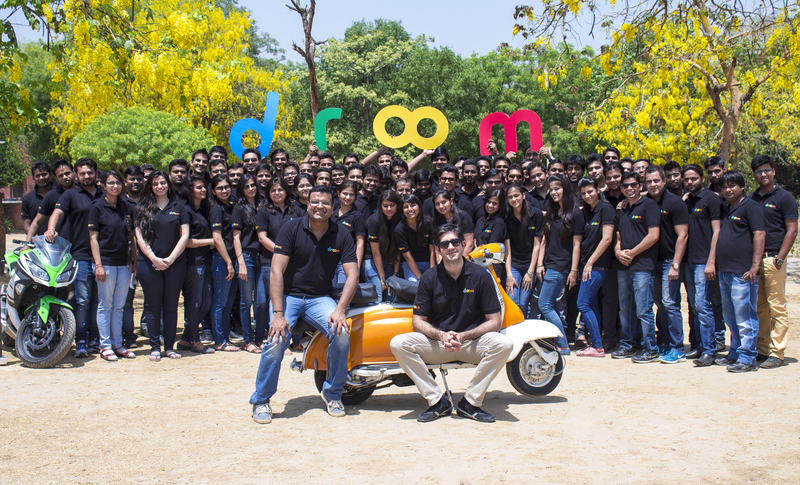 Sandeep is the ceo & founder of Droom, India’s first marketplace for automobiles. Prior to Droom, Sandeep founded ShopClues.com, India’s first and largest managed marketplace in his house in Silicon Valley in late 2010 and in August 2011 moved to India and led a team of three other team members to launch ShopClues. In two years Sandeep led ShopCues to be the 4th largest E-Commerce Company in India, up from 35th entrant with highly differentiated focus on SMEs merchants and non-standard E-Commerce categories. He has 17 years of global experience in business operations, strategy and investment, focusing on Internet and technology. He is counted amongst leading Internet experts globally, and has regularly appeared on CNBC, Fox, ABC News and regularly quoted by Wall Street Journal, Fortune, Forbes and other prominent media outlets. Prior to founding Droom and ShopClues, Sandeep was among the most renowned Internet analysts on Wall Street based out of Silicon Valley, providing research coverage on Google, Yahoo!, eBay, Amazon, Netflix, Priceline, Microsoft, MakeyMyTrip etc. Prior to being an analyst Sandeep worked in strategy roles with senior leadership team at Microsoft in Seattle and Schwab.com in San Francisco. Sandeep has an MBA from Washington University in St. Louise, USA. Sandeep is chartered member of TiE Silicon Valley and holds one US patent. India’s Biggest Bike Mela Now Open!